The Cuban missile crisis of October 1962 was triggered by the Soviet deployment to Cuba of medium-range, nucleararmed ballistic missiles. The United States demanded that the Soviet Union remove these missiles and imposed a naval blockade on Cuba, threatening to sink any Soviet ships that approached the island without permitting their cargoes to be inspected. Eventually, the Soviet Union (U.S.S.R.) announced that it would remove the missiles, and the crisis ended. Most historians affirm that the world has never been closer to global nuclear war than during the 13 days of the Cuban missile crisis (Oct. 14–Oct. 28, 1962). The roots of the Cuban missile crisis go back, in part, to an earlier crisis—the failed Bay of Pigs invasion of Cuba by Cuban expatriates trained, supplied, and directed by the U.S. Central Intelligence Agency. The purpose of the failed invasion was to overthrow Fidel Castro's leftist rule of Cuba, but had two unintended effects. First, it frightened Castro, causing him to make concessions to the U.S.S.R, which wanted to place military bases on the island of Cuba, in exchange for protection against further U.S. invasion attempts. Second, it heightened tensions between the U.S. and U.S.S.R. Khrushchev, the Soviet leader, read U.S. weakness in the Bay of Pigs fiasco, and blustered publicly that he might retaliate by driving the U.S. out of West Berlin. U.S. President John Kennedy, in return, openly boasted that the U.S. possessed many more (and more accurate and deliverable) nuclear missiles and warheads than the U.S.S.R., and would consider striking first with them if it ever found itself at a military disadvantage. Kennedy's claim was true; in 1962, the U.S.S.R. had at most 20 or 30—perhaps as few as four — functional, deployed intercontinental ballistic missiles (ICBMs); the U.S. had several hundred. Nevertheless, Kennedy had claimed, during his presidential campaign, that the incumbent Eisenhower's administration had allowed the Soviets to get ahead of the U.S. in missiles, causing a "missile gap." A missile gap did exist, as Kennedy knew, but in reverse; it had always been the U.S. that was far ahead of the U.S.S.R. in such weapons. Once in office, Kennedy dropped the old story about the "missile gap" and brandished the United States's nuclear superiority openly against Khrushchev. Khruschev's response was to secretly build missile bases on Cuban soil to compensate for Soviet inferiority in ICBMs. These missiles were medium-range and intermediate-range, rather than intercontinental, but from Cuba could reach the entire continental U.S. except its northwest corner. Similar missiles had been by stationed the United States for years in Turkey, which borders southern Russia. Castro gave permission to the Soviets to build Cuban missile bases in trade for a promise of protection against U.S. invasion and for cancellation of Cuban monetary debts. 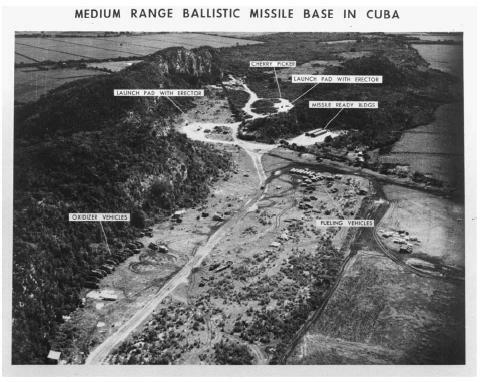 A low-level photograph taken November 1, 1962, of a medium range ballistic missile site at Sagua La Grande, Cuba, showing launch erectors removed and the launchpads bulldozed over. also aware that the U.S.S.R. had never yet placed nuclear weapons outside Russian territory; these factors made it seem unlikely that nuclear weapons were part of the Cuban buildup. Nevertheless, they were. U-2 spy planes (aircraft designed to take reconnaissance photographs from very high altitudes) were making regular flights over Cuba, observing the military buildup. On October 14, a U-2 spy plane photographed an area near San Cristóbal, Cuba, revealing launch pads, missile erectors, and transport trucks for medium-range missiles. Four of the launchers were already in firing position. Khrushchev had decided to deploy launchers for at least 16 intermediate-range missiles (capable of reaching most of the continental U.S.) and 24 medium-range missiles (capable of reaching the southeastern U.S., including Washington, D.C.). The U-2 pictures were shown to Kennedy on the morning of October 16. Much like the Kennedy administration's claims during the Bay of Pigs crisis that the U.S. had no illegal intentions in Cuba, Khrushchev's claims to have no desire to base missiles in Cuba had proved to be untrue. Kennedy hastily assembled an ad hoc executive committee of the National Security Council, which helped him come up with two alternative plans: (1) Immediate attack on the Soviet missiles sites in Cuba, followed by a full invasion of the island using 180,000 U.S. troops. (2) A naval blockade of Cuba, to be lifted only if the Soviets removed its missiles. If the blockade did not work—and it was a risky plan, as such a blockade is, by international law, an act of war—the invasion plan would be carried out. "This sudden, clandestine decision to station strategic weapons for the first time outside of Soviet soil is a deliberately provocative and unjustified change in the status quo which cannot be accepted by this country if our courage and our commitments are ever to be trusted again…To halt this offensive buildup, a strict quarantine on all offensive military equipment under shipment to Cuba is being initiated. All ships of any kind bound for Cuba from whatever nation or port will, if found to contain cargoes of offensive weapons, be turned back." A U.S. invasion of Cuba, had it occurred, could have escalated rapidly to nuclear war, first in Cuba and then globally. The entire world, including Kennedy and Khrushchev and their advisors, feared throughout the crisis that global nuclear war was extremely probable. If nuclear war had occurred, it could have caused hundreds of millions of deaths, and significantly destroyed the U.S., the U.S.S.R., and many other nations as functioning societies. On October 26, Khrushchev sent a private message to Kennedy indicating that he would be willing to remove the missiles if the U.S. would promise not to invade Cuba. The following day, a more formal message said that Soviet Union would remove its missiles only if the U.S. would remove its Jupiter-class intermediate-range missiles from Turkey. In secret negotiations between Soviet ambassador Anatoly Dobrynin and U.S. attorney general Robert Kennedy (brother of President Kennedy), the U.S. did promise not to invade Cuba in exchange for withdrawal of the Soviet missiles; it did not, however, promise to remove its missiles from Turkey. These missiles were considered largely symbolic by U.S. strategists, and were technically unreliable and obsolete. Additionally, their threat to the U.S.S.R. could have been replaced by deployment of a Poseidon submarine carrying nuclear missiles to the eastern Mediterranean. In secret, therefore, Kennedy seriously considered trading the missiles in Turkey for the missiles in Cuba, although in public he refused to do. On October 28—one day before the deadline urged by the U.S. Joint Chiefs of Staff for launching a Cuban invasion—the Soviets stated that they would remove their missiles from Cuba. The crisis abated. Many historians have viewed Kennedy's handling of the Cuban missile crisis as a masterpiece of statesmanship. The Soviet Union backed down; its missiles were removed; U.S. goals were fully met; American geomilitary prestige was preserved. Other historians argue that the Kennedy administration was not as deft in reality as it seemed publicly. Kennedy and his advisors were badly frightened; Secretary of State Dean Rusk began to weep when told, at the height of the crisis, that a U-2 plane had been shot down over Cuba. Robert Kennedy said later that his brother had put events in motion that he could not control. What is certain is that Khrushchev and Kennedy were both willing to risk global nuclear war for dubious gains. The Soviets were soon to achieve strategic nuclear parity with the U.S. simply by building more and better ICBMs; any strategic advantage to be gained by placing missiles in Cuba would, therefore, be short-term. By the same token, no long-term U.S. interests were at stake in the deployment of Soviet intermediate-range missiles to Cuba, as within a few years every city in the continental U.S. would be vulnerable to Soviet ICBMs and submarinelaunched ballistic missiles anyway. Kennedy administration officials knew that the Soviet buildup in Cuba would, at worst, decrease the United States's massive strategic advantage, or appear to do so—in Kennedy's words, make the Soviets "look like they're coequal with the U.S." Kennedy was thus, willing to gamble the world's future not to save the U.S. from an imminent military threat, but because to tolerate the Soviet buildup in Cuba would, in his words, "have politically changed the balance of power. It would have appeared to, and appearances contribute to reality." The U.S. emerged from the Cuban missile crisis with greatly expanded confidence in its own geopolitical skill. Its policymakers had verified, as they believed, that "showing resolve" (threatening to use military force) was more effective than diplomacy, the United Nations, or international law—with the proviso that the U.S. should be more willing to commit conventional (non-nuclear) military forces in a crisis, in order to keep back from the nuclear abyss. Today, many historians argue that U.S. willingness to invade Vietnam is directly attributable to its success during the Cuban missile crisis. Nathan, James. Anatomy of the Cuban Missile Crisis. Westport, CT: Greenwood Press. 2001. Frankel, Max. "Learning from the Missile Crisis." Smithsonian. October, 2002: 53–64.